V1559 – Guy Laroche. I love the juxtaposition of the classic fitted sheath dress with the casual denim shirtdress vibe. This is one I’m really torn about from a personal perspective though. There are a lot of things I really like about this dress, but I don’t know if I could see myself wearing it. 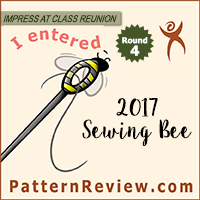 I’m not sure it needs to join my pattern stash, but I do love the design, and I’m really excited to see other bloggers make their own versions. V1561 – Zandra Rhodes. Swing coats are another style that I’m not overly excited by, but I do love the curved lines around the yoke area. Very pretty. V1562 – Lialia by Julia Alarcon. This jacket has a lot of great classic detail included in the design. Also love the vaguely 1920’s silhouette. Once again, it is a pattern I really like, but I’m not sure it is the best for me – I feel like I have many similar/better options already, but I do think it would be an amazing tailoring project for someone who would look great in these straighter lines. V1563 – Rachel Comey. Another jacket pattern with lots of detail. The color blocking looks great, and I love how the classic silhouette blends with the more modern use of fabrics, and the extremely fitted cuffs should make this a really warm jacket to wear (with a scarf and turtleneck anyway). V1558 – Rachel Comey. Love this dress! Simple lines and soft pleating detail would look fabulous in a solid or a print fabric. This is at the top of my “must buy” list from this release. V1556 – Rachel Comey. I also find this to be a really interesting design. By all accounts the wide belt/obi look was super popular on fall runways, so I expect this will fall squarely in the “on trend” category. Another look I’m personally conflicted by – I love all the interesting detail, but I really don’t see myself wearing it. V1555 – Tom and Linda Platt. I’m always a sucker for a good color block, and I particularly like that the lines are echoed on the front and back of this dress. V1553 – Koos van den Akker. Very cute with lots of trim details. Another look that will be a pass for me, but could definitely look very cute on the right person. V1554 – Isaac Mizrahi. It’s a pretty simple pleated dress, but I like it. The insertion of sheer lace into the hem design is quite an interesting idea as well. Simple, but I like it. I can’t help but imagine this dress paired with a cropped moto jacket, though in a different fabrication it would be perfect for a spring wedding. I love how fabric choice and styling make this design incredibly versatile. V1560 – Anne Klein. Very classic trouser with boxy jacket. V1564 – Today’s Fit by Sandra Betzina. I like this – the hood looks like a really interesting design, as it is part of the front of the coat, not a separate seam. It looks really cozy for a rainy day, and simple lines make it easy to sew on technical waterproof fabrics. V1552 – Today’s Fit by Sandra Betzina. Personally I’m not one who likes to add volume to the hips, but the model photo is a bit more flattering than I’d expect based on the line drawing. Fabric drape is going to be critical to sewing this pattern successfully. V9264 – Very Easy Vogue. Crushed velvet, drab florals, and puffy sleeves. It really does make me think of a skating dress from the late 1980s. I may have previously made myself clear about how unexcited I am by these trends, but I’ll reiterate here. Not excited. I will say, however, that Vogue did make the maxi floral gown come close to looking elegant. Still not on my wishlist, but I am somewhat impressed. V9265 – Very Easy Vogue/Custom Fit. One of the few fall designs that continues the voluminous sleeve trend. I’m a bit more excited by this than the previous style, but it is a fairly basic princess seam bodice and skirt combo. V9267 – Vogue Easy Options/Custom Fit. I know this is very similar to many previous Vogue Easy Options styles, but I really like it! 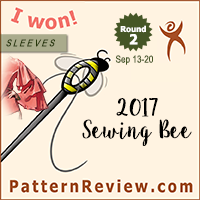 The custom cup sizing is a great selling point, especially on a bodice with so many darts and seams. V9266 – Very Easy Vogue. I was wondering when the copycat patterns would start to arrive. On the one hand I do like this design. On the other hand, I have no desire to be visually associated with the administration that this represents. Pass. V9269 – Julio Cesar NYC. Cute shirt dress, though perhaps a bit short for me. Nice way to mix prints and solids to create a top/skirt look. V9271 – Julio Cesar NYC. Looks like some interesting detailing on this top, though I’m never one to go for such a boxy silhouette. V9275 – Vogue Wardrobe. I find the styling a bit odd, but this has some nice casual pieces. Definitely not something I would think of as being work appropriate, though Vogue seems to have styled it that way? V9268 – Kathryn Brenne. I wanted to dismiss this immediately as being boring, but the more I look at this dress, the more I’m intrigued by the softly draping skirt. Similar to the Today’s Fit style, but a bit more wearable perhaps? It looks like a bit of a fabric hog, but should be pretty simple to sew together. Perhaps this one will make it onto my sale day shopping list? V9272 – Marcy Tilton. I think this is a great addition to the Marcy Tilton line – it definitely fits her aesthetic, but I think this is a top that will appeal to those who don’t typically buy her patterns. Looks like a fun, comfortable top for fall. V9273 – Very Easy Vogue. I’ve been thinking about making a vest, though these styles seem a bit too square and masculine for my personal taste. Looks like the boxy 80s tailoring is making a comeback. V9270 – Very Easy Vogue. Another style that has a slight nod to the excessive sleeves of the spring and summer months, though much toned down for fall. V9274 – Very Easy Vogue. The asymmetric coat is pretty interesting. Not much to say about the elastic waist pants. V9276 – Tafa Vogue Accessories. Cute options for fancy gown cover-ups. And that’s it! On the whole I’m seeing trends towards boxier styles and more masculine tailoring and silhouettes, almost as a rebuttal to the overly flowy and ruffly looks of the summer. My favorite looks are actually some of the simplest pieces, without any of the heavy 80s influence. Though this may have something to do with the obsessive reading research I have been doing on style types (more on this in an upcoming post) and thinking I’ve been doing about how this will impact my wardrobe planning. Regardless, I think this is a strong release from Vogue. I don’t find that there are a lot of things I want to make and wear, but I do think that there are quite a few strong looks from this collection that I could see certain sewing bloggers going nuts over. What do you all think? See anything here that you can’t wait to add to your fall wardrobe? Or are the looks in this release too 80s for you to get excited about? Feel free to discuss in the comments! I’m not really loving this collection. The Guy Laroche dress didn’t grab me; even the runway version didn’t appeal. I can see why Vogue picked it though because the same basic dress appeared four times in the original collection in slightly different fabrics and trims; lots of inspiration there if you like the style in the first place. Yeah – I feel like I find this set inspiring, but there aren’t actually that many patterns I’d want to buy or wear. It’s an interesting conundrum, as usually if I like it, I’ll buy it with the intent of sewing it at some point, but not so much the case this time around. On 1556, I love the bodice and belt but the pleated skirt kills it for me. The Betzina raincoat looks pretty fabulous! I think the Guy Laroche dress is pretty spectacular and I saw a jacket version of it pop up on instagram too (easy to recreate from this pattern). However like you, I don’t know that I’d get a lot of wear out of it and I’m slightly put off by the slits under the arms. Other than that there isn’t much here that is new or exciting to me, I can probably come up with similar patterns from my Burdas (although that has not previously stopped me buying things anyway come sale time!). You lost me with your political referenc on V9266. Since when does sewing and politics mix? I would argue fashion and politics have always been intertwined to some extend. Extending that to home sewing, if you look back on older pattern releases, you can find many copycat patterns for famous looks, including wedding gowns and inauguration dresses. The idea that people want to dress like the rich and famous is nothing new; it’s why there are so many fashion magazines and tabloids dedicated to the topic. So, actually, they mix quite a bit in my opinion. I think Doctor T’s comments are spot on. I can’t wait to purchase the v1558 and v9267 dress patterns. Also loved the liberty patterns…they are classic designs that I can actually wear to work. 9276,1558 and 1556 I just bought. I love 9266 but I concur with your assessment completely and that’s the only reason I abstained from this one! Thanks. I couldn’t find anywhere to contact you directly, please delete this if it’s a bother: I’ve got to find some 16th, 17th, and 18th century all-around fashion refs for Canadian Horse history project and I can’t find any, would you have any idea where I could find some? Hmmmm… That sounds like a really specific project! (But super cool – my mom was a horse person, so I was raised with a fair bit of education about horses, and I’m turning into a fashion nerd, so I love this.) I’m not sure where you could find a good resource for that – I’d try looking for books about the Canadian Horse and see if you could find any art or photo reprints to use as primary sources? I’m not that familiar with the Canadian Horse in particular, but perhaps looking at military uniforms would be helpful. As far as the general history of fashion during the time period, I did just discover that you can download a bunch of free fashion history books from The Met (OMG so excited) – maybe try looking through some of these? I searched in the Textile Department – there are some gorgeous art book PDFs available there. You might try looking in the American History Department to see if you can find any resources there if you specifically want to look at American fashion. As a last resort, I know there are some great fashion history books on Amazon; the “Fashion in Detail” series and the “Patterns of Fashion” series in particular might be beneficial depending on what types of info you are looking for. Anyway, hope that helps. The sources are a bit all over the place, but there are a lot of places to get fashion history information nowadays, I’m sure there are plenty of other great resources out there. Let me know how the project goes – it sounds really interesting! I have LOTS of links and connections specifically for the Canadian Horse itself, but for the fashion of the period I’m completely lost. That link to the Fashion of New France (Quebec, basically) is extremely helpful! So is that link from the Met!! Thank you so much Doctor T for that. It’s harder than I thought to find accurate clothing refs for specific periods, unless it’s related to generic times in history. My searches had not brought up those links you gave me. It’s actually the third time I’ll be working on a Canadian Horse project, but this time I’m doing it (in between paying projects) for myself. The last two times were maaannyy years ago, and I’m hoping my skills have improved since then, and I want to do it MY way, focusing on art, both of the horse itself (still a threatened breed), and of the various times in history. The framework is already done. It gives me the chance to practice what I need – drawing fashion isn’t something that is requested often (unless it’s Star Wars related, or occassionally: mythology ((fun to paint!)) ) – …. and I could go on forever. But history is always interesting, and I hope I can make this succeed! Seeing Yaya Han really cool cosplay costumes has inspired me to at least attempt to do it proper-like when putting this together. holey smokes….. the sheer amount of books they offer…. O_O … gads….. I know! There are at least 2 on horses and clothing btw – one on horse armor, but one on equestrian clothing. That should be helpful I hope! I downloaded 16 of them… (embarrassed smiley here) Fashion for horses, fashion for riders, armour for both……… There is even one on Haute Couture!